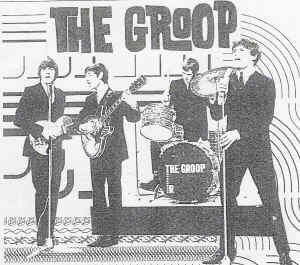 One of many "two-phase" groups that featured in the Aussie rock scene of the 60s, the first incarnation of The Groop emerged from Melbourne's thriving performing circuit in 1966, with a unique sound which hinged around a mixed repertoire of soul classics, big beat numbers and whimsical originals from all four members. The Wesley Three evolved into The Groop in 1965 with the addition of English-born guitarist Peter Bruce, who was recruited through a 'musicians wanted' ad in a music shop window. The Groop's publicity touted Bruce as being an ex-member of The Dave Clark Five, but this was only half-true. In the May 2002 issue of the Dave Clark Five magazine, Peter finally came clean to writer Alan Harvey about his link with Dave Clark. Peter had known Dave in the UK, when Clark because in 1957 DC had a skiffle band, The Dave Clark Quintet, and Bruce was in another skiffle band, The Hill City Skiffle Group (later Rocky Lee and his Cats). They played gigs together and Bruce did PR for both groups. "I was never a member of the Dave Clark Five, despite the stories. When Dave and the guys came to tour Australia I asked him if I could use the group's name to help promote my own band The Groop, he was happy for me to use his name anyway I wanted to help us kick off (which I did). So I said I had been a member of the pre-famous DC5 which of course I never was, although I had been around when they first started." The Groop drew on a range of diverse musical influences including jug-band and Cab Calloway-style "jump" music, as well as zany vaudeville/cabaret material. They performed on the Melbourne upper-class social circuit, establishing a solid following with gigs at debutante balls, college formals and similar events. After signing to CBS in 1965 they released theur first two singles, "Ol' Hound Dog" and the double-entendre laden "The Best In Africa". Although considered by some as frivolous novelty records, they proved very popular both with radio programmers and the buying public, and both made the Top 20 in Melbourne. Their self-titled debut album (CBS 1965) featured severeal witty originals, together with covers of staples like Them's "Gloria"; it sold in respectable numbers, particularly in their hometown, where they were feted as a top-drawer live attraction, strongly supported by regular airplay on Melbourne radio stations 3UZ and 3AK, TV appearances and consistently favourable and prominent coverage from the fledgling Go-Set magazine. (Go-Set, and especially staff writer Ian "Molly" Meldrum, championed them throughout their career). A third single, the vaudeville-styled "I'm Satisfied" (b/w "Bad Times") gave them their best chart placing to date, and the band also recorded a second LP, I'm Satisfied, in mid-66, but their fourth single "Empty Words" / "The Gun And Flowerpot Trick" stiffed, so McKeddie and original manager Tony Dickstein decided to head for England in August 1966, leaving the band in disarray. Rare 1966 videos of the original Groop performing "I'm Satisfied" and "Empty Words" (probably on Kommotion) can be viewed on YouTube. Peter Bruce then tendered his resignation, leaving the rhythm section of Max Ross and Richard Wright to re-build the group. They first recruited the multi-talented Don Mudie, and were soon successful in wooing singer Ronnie Charles (Ron Boromeo) and keyboardist Brian Cadd (who, at Molly Meldrum's suggestion, briefly changed his surname to Caine) from The Jackson Kings, who had been performing around Melbourne, with a residency at Melbourne's premier blues/rock haunt Garrison and had released a couple of R&B-styled singles on CBS. The Jackson Kings had attracted The Groop's attention when they supported them at McKeddie's farewell party. 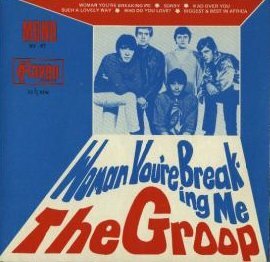 The Groop were apparently only interested in Ronnie and didn't really want a keyboard player at all, but Ronnie stuck by his mate and suggested that Brian be taken on as well. Most accounts of The Groop have wrongly reported this story in reverse (i.e. that the band wanted Brian but didn't want Ronnie) however both Ronnie and Caddie have recently confirmed the fact that it was Ronnie who was first approached to join the band. The new lineup made its recording debut in late '66 with a storming rendition of Solomon Burke's "Sorry" (b/w Bo Diddley's "Who Do You Love"), scoring a national Top 10 hit. Both live and on record, Ronnie Charles' gritty, soulful voice was the undoubted focus (not to mention his dark, sultry looks that appealed to a growing contingent of young lady followers) but the new Groop proved to be an extremely tight, musically dextrous and creative pop band, each of whose members contributed to the songwriting. In May 1967 saw the release of the soul-inflected, reverb-drenched "Woman You're Breaking Me" (b/w "Mad Over You", which was written by, and heavily featured drummer Richard Wright, with organist Brian Cadd. This was a major hit -- #6 in Melbourne, #12 in Sydney -- and even charting in some key American centres when it was put out by Columbia Records there. The single was followed by an album of the same name. It was a strong collection of originals and well-chosen covers that were mostly drawn from the band's current popular performing repertoire. It's also notable as one of the first Australian pop LPs to be recorded in stereo. "It was The Groop's day. Their performance was brilliant and they left no doubts in anyone's mind that they will be great ambassadors overseas, both with their music and their personalities"
"...(we were) up and down the country, at The Revolution (with Ringo in the audience! ), The Speakeasy, The Marquee, anywhere that would have us!" During The Groop's eleven-month stay in Europe, they made several recordings. CBS UK issued both "Woman You're Breaking Me" / "Mad Over You", and a second single, "Lovin' Tree" / "Night Life", made the Top 10 in Germany, and they toured there successfully in July that year. Perhaps the most intriguing of these sessions was the one that yielded the notorious, raunchy "Maid Of Iron", a collaboration with Harry Vanda and George Young that was cut at The Easybeats' London recording HQ, Central Sound in Denmark Street. The song was never released, most likely because of its supposedly questionable lyrical content; another track, "Mandrake Wine", also remains unissued. The only officially-released English recordings came out on an early 1968 single. "Seems More Important To Me" was a multifaceted rocker with Sgt Pepper-style guitar flourishes. The flipside, also a Ross/Cadd original, was a whimsical, bass-driven roundelay called "Annabelle Lee". Sadly, this absolutely superb acid-pop double A-side record failed to chart after its release in Australia. However, the Ross-Cadd team had some success in placing tunes with other artists, notably "When I Was Six Years Old", which was a hit for both English singer Paul Jones and Australia's Ronnie Burns. They also came to the assistance of The Masters Apprentices -- they had just lost their songwriter Mick Bower, who was forced to leave the group after suffering a nervous breakdown -- and the Cadd-Ross song "Silver People" (retitled "Elevator Driver" for their version) proved to be a vital stepping stone in group's continued career, providing them with a national Top 10 hit. Just before its return to Australia in October 1968, Max Ross left due to illness, and he was not replaced; Don Mudie switched to bass and the band continued as a four-piece. Don Mudie proved to be a perfect songwriting foil to Brian and their bubbling, organ-propelled "Such A Lovely Way" was released in 1968 to great acclaim, making the national Top 20. Nevertheless, the band had become destabilised and restless in the wake of founding member Ross' departure. Another significant factor was that Cadd had fallen under the spell of The Band's seminal Music From Big Pink (evident in the choice of Richard Manuel's "We Can Talk" as the b-side of "Such A Lovely Way") and he was keen to move his music in that direction. After their tenth single, a fine soul-inflected groover called "You Gotta Live Love" / "Sally's Mine", was ignored, The Groop abruptly broke up mid-year. In spite of the recent chart failure they were still extremely popular, so there was shock on the Australian pop scene when it was splashed over the cover the 10 May edition of Go-Set. 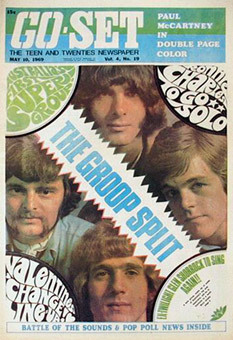 The Groop breakup and the formation of Cadd and Mudie's new band Axiom was extensively covered by Go-Set over succeeding weeks, and there was evidently some rancour about the fact that (as they later admitted) Cadd and Mudie had been considering the move for some time, but had not advised Richard and Ronnie about it. There was one final triumph for The Groop, though few knew of their role in it at the time. 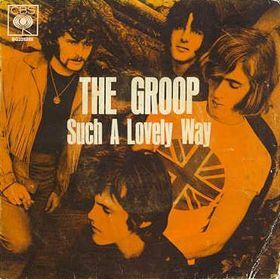 In much the same fashion as studio band Pastoral Symphony -- whose 1968 hit "Love Machine" was essentially an augmented Twilights, with Ronnie Charles on backup vocals -- The Groop played a major part a similar project that commenced in late 1968 with producer Ian Meldrum engineer John Sayers and arranger John Farrar (The Strangers) -- the groundbreaking studio epic "The Real Thing" by Russell Morris. 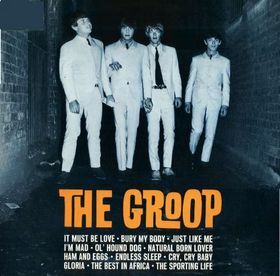 The Groop's rhythm section (Cadd, Mudie and Wright) provided the backing for the basic track, which was augmented with further session contributions by Zoot guitarist Roger Hicks, plus Ronnie Charles and Maureen Elkner on backing vocals. Released in March 1969, it dominated the #1 spot in the middle months of that year. The Groop also provided the backing for Morris' hit sequel, "Part Three Into Paper Walls". The connection with Morris in fact went back several years -- The Groop gave Russell's first band Somebody's Image their initial break onto the Melbourne scene by giving them support spots at local gigs. Ronnie Charles embarked on his solo career with the recording of two tracks for a planbned debut solo single -- the sumptuous "Katy Jane" and a specially-penned Billy Thorpe song titled "Natural Man", which is aprticularly ineresting to collectors since it features the (otherwise unrecorded) Lobby Loyde-era Aztecs as backing band. Unfortunately, due in part to record company politics, it was never released. In early 1970 Ronnie formed Captain Australia and the Honky Tonk with ex-Somebody's Image member Brian Hollaway and ex-Grooper Richard Wright. Wright quit in August, and joined a shortlived trio called Love Story with Buddy England and singer-guitarist and former Go!! Show host Ian "Turps" Turpie. They released one single, "Neanderthal Man" / "But Not For Me" on the Air label in September. Wright then joined Wizard (1971) followed by a spell in seminal country-rock band Sundown, which also featured Keith Glass (18th Century Quartet, Cam-Pact), Mark Barnes (Party Machine, Cam-Pact) and Kerryn Tolhurst (Adderly Smith Blues Band, Country Radio, Mississippi, Dingoes). Captain Australia disbanded in early 1971, and Ronnie returned to England. In 1973 he released two quality albums -- the first was the self-titled album by his band Atlas, a hard rock group featuring ex-members of Wishbone Ash and Renaissance. It was followed by Ronnie's first solo album, the lavish Prestidigitation, an ambitious rock-orchestral project produced by American impressario Lou Reisner and backed by the London Symphony Orchestra and English Chamber Choir. A single lifted from it, an orchestral version of Eric Clapton's "Layla", charted in some European countries. Unfortuntately the album came out just as punk was taking off in the UK and it sank without trace, and has regrettably never been re-released. Ronnie continued to record and perform through the late seventies-early eighties, including much session work, and his distinctive voice could also be heard on many advertising jingles. He returned to Australia in the late 1970s. In 1980 he recorded a single backed by Melbourne band The Runners, "Rock and Roll Hoodlum" / "Aim for the Stars", which came out on the Full Moon label. As well as issuing a second solo album, Hands Off, in 1983, Ronnie also performed with White Light Orchestra, Turbo Luv Nuns, Running Scared and Post Mortem during the 1980s. He still lives in Melbourne and currently fronts Ronnie Charles & The Retro Bandits. In late 1969, Don Mudie and Brian Cadd teamed with former Twilight Glenn Shorrock to create one of Australia's first supergroups, Axiom, who achieved considerable success with a batch of strong singles and two superb LPs. After the demise of Axiom, Cadd played a major role in the recording of Russell Morris' acclaimed solo LP Bloodstone (1971), and then embarked on a very successful solo career, which is documented in detail on our Brian Cadd page. 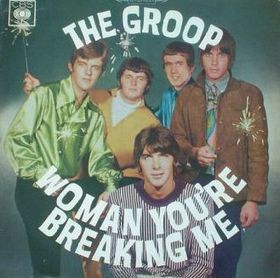 The Groop reformed for a national tour which spanned late 1988 and early 1989. It was a welcome treat for fans, being an amalgam of both Mk I and Mk II members, including original singer Peter McKeddie and his successor, Ronnie Charles. The well-received reunion tour coincided with the release of Glenn A. Baker and Pete Shillito's CD compilation for CBS, The Best and The Rest. 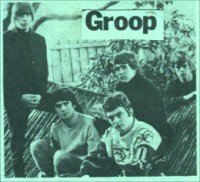 Thrilling nostalgic audiences with a non-stop barrage of hits from the stages of regional clubs on most of eastern Australia, the reconvened Groop proved conclusively what an immense contribution they had made to Australian rock music. "Happy With a Love Like Yours"
Tracks 1-2: The Jackson Kings / 3-6: The Groop Mk I. / 7-20: The Groop Mk II. Compiled by Glenn A Baker and Pete Shillito. - Russell Morris (vocals) with backing by The Groop and others. Many thanks to Ronnie Charles and Brian Cadd for corrections and additional information. Please email webmaster@mielsago.com if you have more information or correctins, or to report any broken links.